Pickslyde excels and 21st Century Behavior-Based Safety and Building Safety Commitment. 21st Century Behavior-Based Safety is a scientifically proven method for reducing incidents and injuries in the workplace. Over the last thirty years, behavior-based safety has been implemented in thousands of companies worldwide, and sharpened through scientific investigations. Safety engineers and behavioral scientists have learned a great deal about making behavior-based safety more efficient and effective over the decades. Because science is a systematic enterprise of building knowledge, behavioral scientists have accumulated a great deal of applicable information for creating stronger safety cultures by promoting safer actions, addressing environmental hazards, and improving productivity. Pickslyde Consulting’s 21st Century Behavior-Based Safety capitalizes on the latest findings, and creates solutions for accelerating safety outcomes in organizations. Front-line associates act more safely and contribute to a stronger, more cooperative work community. Supervisors create a framework for clear and effective safety management while maintaining, and even enhancing productivity. Leadership develops a more robust safety climate while efficiently and economically accelerating the bottom line. Modern science has given us cutting-edge tools and increased knowledge for improving safety, such as high-tech personal protective equipment and more effective management systems. However, investments in the best flame resistant clothing, air-purifying respirators, and chemical resistant gloves are only useful if people make a commitment to wearing them. Similarly, expertise in proven leadership practices can help you be a better leader but again, they are only beneficial if you make a commitment to use them. Behavior-based safety processes have been proven effective in reducing incidents and injuries but their effectiveness also requires an essential ingredient: commitment. 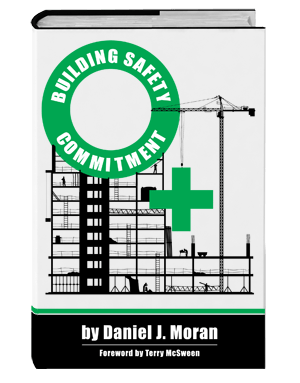 Dr. Moran’s book, Building Safety Commitment, discusses proven ways of increasing people’s dedication to safety in the workplace.